This charming two tone pendant is 14ct yellow and white gold and made in Ireland. 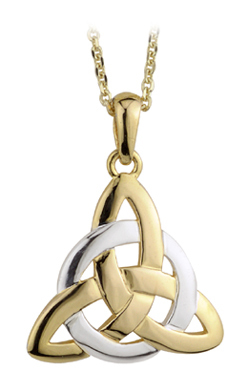 This lovely pendant shows the classic trinity knot . Just wondering what the best price you can do on this is. I can get the exact same pendant for quite a bit cheaper ... in 14k Gold as well. New Trinity Knot Pendant With A Diamond S45347,Pendant is supplied with a chain. Measurements 5/8''wide & 3/4'' long. S8458 - Christening Celtic Cross,10ct Yellow gold, very small. This celtic cross is made in Ireland.